Murdo Murchison's life turned upside down on August 30th 2016 when he collapsed with a massive seizure. Within six hours he held the result of a CT scan showing a two centimetre tumour in his brain. This book brings together tales from Murdo's life: humorous exploits from his Highland childhood, experiences from his career as a business owner, and stories about his family and friends. Although these stories are written as he faces a life cut short, each chapter pulsates with a love for his Lord and Saviour and a sweet realism as he recounts the lessons he has learnt during a life well lived. 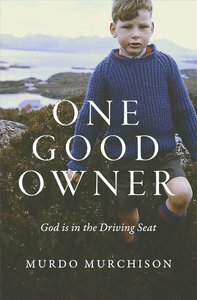 About "One Good Owner: God is in the Driving Seat"
Murdo Murchison, born and bred in the Highlands, owned a much-respected used car warehouse close to Stirling in Scotland. A man of God who has a deep love for his home, he has been a church planter and preacher in his spare time for several years.